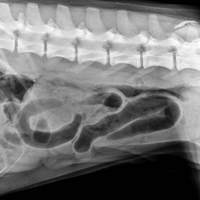 Alan Lipman, DVM, DACVR, is back with some abdominal radiographs suspicious for one of our most common summertime foreign body ingestions. Can you spot the problem in these radiographs? A 9-month old Labrador retriever presented with a two-day history of anorexia following ingestion of garbage. No vomiting or diarrhea was reported and the patient was slightly lethargic. Abdominal palpation revealed a tense abdomen but no other palpable abnormalities. Abdominal radiographs were made and the lateral view is presented for your evaluation. A well-marginated, rectangular gastric foreign body is present which represents a corncob. Also apparent is a small piece of corncob within the small intestine in the middle of the abdomen. Mildly distended small intestinal segments are visible; however, the degree of distension is not consistent with obstruction. An exploratory laparotomy and gastrotomy was performed for removal of the large gastric foreign body and the patient recovered well. This foreign body was fairly obvious on radiographs; however, not all corncob foreign bodies are that large or obvious. Often, much smaller segments of this foreign material are present within the small intestine resulting in mechanical obstruction. Figure 2 illustrates this more common situation in which the radiograph reveals a smaller corncob foreign body. Gastric foreign material is sometimes very conspicuous due to the material being surrounded by gas; whereas, small intestinal foreign material surrounded by fluid can be more challenging to identify. Actively looking for a section of corncob will increase diagnostic sensitivity in cases of possible mechanical obstruction, especially during the spring and summer months. Page two is not centered properly. The left side is cute off a bit. I can still make out most of the words it is cutting off but thought you guys would like to know so you can fix for future readers. Great radio graphs for this article too. Hey Racine, we've all tried to repeat the problem with page 2 on different browsers and devices and can't seem to repeat it! If you're still having problems please let us know by sending in a support request. Thanks for alerting us to a potential problem!